Tertullian : 'Irenaeus Philopolis', A True Christian Subject under a Heathen Prince, or Tertullian's Plea for Allegiance (1643) 6 pp. 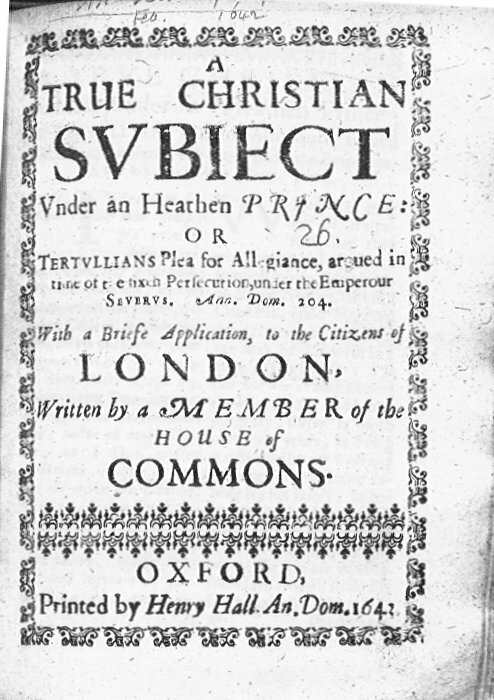 'Irenaeus Philopolis', A True Christian Subject under a Heathen Prince, or Tertullian's Plea for Allegiance (1643) , 6 pp. ris tota sunt. Cap. 33.
plus illi operor in salutem. speak ill, think ill of any ma. our Lawes for us, and they pay him againe with Votes. ces may reach farther then we wish, or you do yet feare. And what would you do, if you should ince prevaile? This page has been accessed by people since 17th September 2002.